Triovest Realty Advisors recently completed what it calls the most detailed stakeholder consultation exercise of its kind in the Canadian commercial real estate sector. The exercise involved interviewing 20 internal and 17 external stakeholders, who included representatives from Triovest ownership, two under-25 Triovest employees, clients, building tenants, suppliers, major industry organizations including BOMA and REALpac, United Way of Greater Toronto and the City of Vaughan, among others. 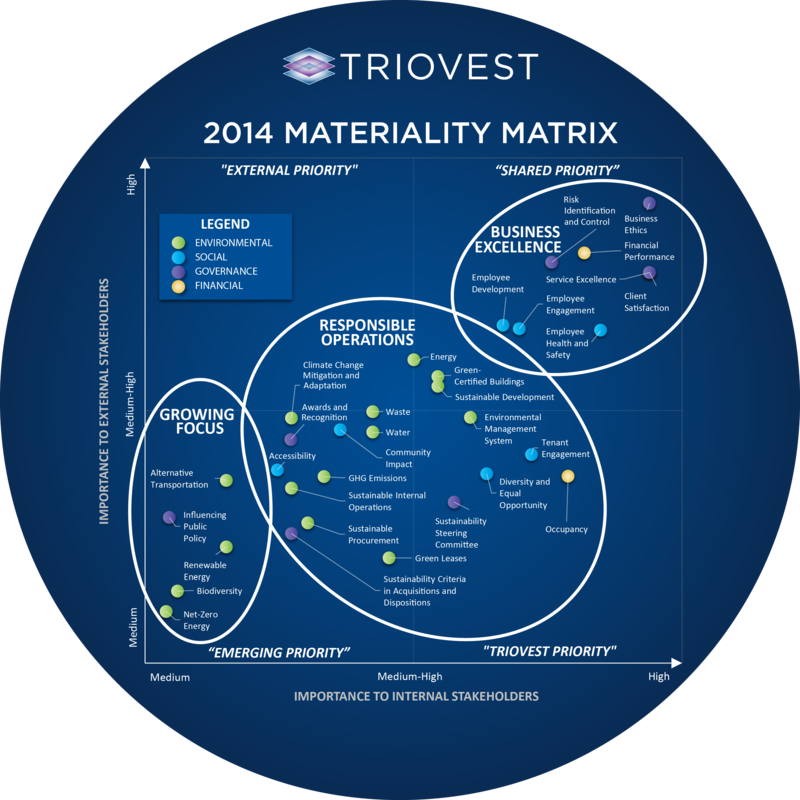 The endeavour enables Triovest to identify and focus on its sustainability priorities and to improve its reporting capabilities. Bernier is still sifting through data, but the research has enabled the commercial real estate investment and management company to create a materiality matrix that includes the results of asking stakeholders to rank 31 topics — broken down into environmental, social, governance and financial categories — with regard to their level of importance. They were also asked to: explain the rationale behind each ranking; identify if topics were missing and their corresponding ranking; and identify whether or not they would increase or decrease in importance over time. The priorities identified internally clearly matched those of its external stakeholders, according to Bernier. “Governance and financial-related topics were the top priorities along with employee health and safety, engagement and development,” he said. Completing the interviews and creating the matrix should enable Triovest to build stronger relationships, create better management practices, refine strategies and increase foresight. The information will also be used to create a sustainability scorecard for the company that will establish a baseline performance across key indicators to provide an understanding of where it’s at and benchmarks to know what’s possible in terms of where it can get to. “It will effectively put the measurements, indicators and targets in place to drive performance in the key things that we really need to focus on today and that will grow with time,” said Bernier, who added the scorecard will be published in the next few months and that its biggest impact on the company will likely be seen in the years to come. 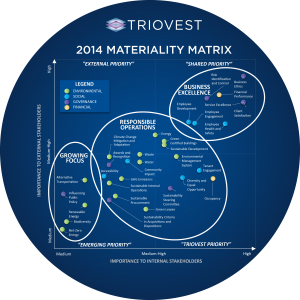 All Triovest employees are asked to create at least one sustainability-related goal so they take personal accountability for driving performance in areas they can influence internally and externally. “As an organization, we touch clients, touch suppliers and touch building occupants,” said Bernier. “There are a lot of opportunities to inspire and make a positive difference, and there’s a lot of work that needs to go into a strong sustainability program that can inspire and communicate effectively. Identifying priorities from the matrix will also be helpful to Triovest and other Canadian commercial real estate companies when it comes to the Global Reporting Initiative’s latest G4 sustainability reporting guidelines. The guidelines offer reporting principles, standard disclosures and an implementation manual for the preparation of sustainability reports by organizations. They were developed through a global multi-stakeholder process involving representatives from business, labour, civil society and financial markets, as well as auditors and experts in various fields.